A new iOS app, from the developer of Fantastical, aims to turn Contacts from something you rarely search into a tool you regularly exploit. Alongside fast search and sorting, it lets you rapidly start calling, texting and emailing directly from it. Flexibits, the maker of long-standing Calendar app Fantastical, has brought its Mac Contacts app Cardhop to iOS. As with the Mac edition, the aim is to both speed up how you use Contacts —and to make you use them more. Rather than occasionally turning to Cardhop to check someone's email address, you can begin the email right within the app. You can begin an email, start a text message or phone them. And where you have to be in a contact to do this when you're using the regular iPhone Contacts app, Cardhop lets you do it all from the search field. 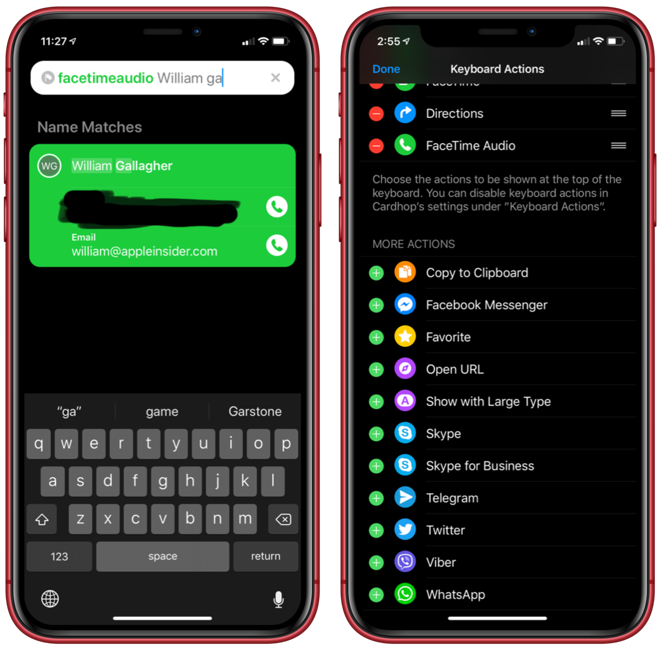 It's a development of the natural language parsing that originally marked Fantastical out as a unique calendar and let you enter an appointment by just typing a sentence about it, instead of tapping to enter each detail separately. While other calendars, including Apple's own, have added this ability to understand or parse what you write, Fantastical remains particularly good at it and now Cardhop is similar. Also as with Fantastical, the benefit of the app is in how it handles your existing data. Fantastical uses the same calendar database that Apple provides and, in exactly the same way, Cardhop uses the same contacts. Make a change to a contact in Cardhop and the same change will be in Apple's own Contacts app or vice versa. This means there's no setting up and there's no copying of contacts to a new app. You could go back and forth between Cardhop and Apple's own at will and there would be no difference in your actual contacts list. If you don't use Apple's Contacts app and instead just use the contacts list in your iPhone, it doesn't matter. These and all major iOS contacts alternatives use the same core contacts database. Trying out Cardhop will be easier if you are used to using Apple's Contacts app, though. That's because if you tend to use the Phone app when you want to call someone —or the Mail app to email, the Messages app to text —then it's hard to remember to use anything else. That said, it's also hard to imagine that any other app could do more than Apple's one. Yet Cardhop does, and what it brings you comes down to speed, organization and action. Open Cardhop and you can see a list of your favorites —though note that this is not the same list of VIPs that you may have set up in Apple's Phone or Contacts app. Apple's privacy rules mean this, and this alone, is something a third-party app can't see. If you want to have favorites for quick calling or emailing, you'll set those up again in Cardhop. When you do that or when you tap through your contacts list to a person you want, though, you can just go into the card for them and see whatever details you've got. However, you can also search for them —but the search box where you would normally enter their name lets you do much more. It lets you take actions that range from calling an existing contact to adding a new one or updating a detail. You start by typing in the name of a contact and Cardhop begins auto-filtering a list of existing contacts. If you type in the name to the point that it becomes unique, it displays the card for that contact. Typing "Mike Wu" might be enough for it to display AppleInsider's Mike Wuerthele's card, for instance. Or, if you've not entered this contact before, typing their name and one piece of information (phone or email for example) will add them to your contacts database. Rather than having to press a plus sign and tap through adding first name, surname, phone number and so on, you've just done it all in one go. Similarly, if you enter an existing name and add some new information after it, that new detail will be added. So if you enter "William Gallagher [email protected]" and you've already got William in your contacts database, Cardhop will check to see if you have that email address too and will add it if you don't. Or type in "call William G" and Cardhop will instantly start a phone call with William without you having to find his card and tap on the number. Since you're typically only ever going to be typing very similar things such as Call or Email, Cardhop comes with those set up in quick-action buttons. It defaults to this basic set, but there are many other Cardhop features that you can elect to include as quick actions. You can have it so that tapping on a Directions button and then typing someone's name will get you all that contact's addresses, for example. Equally, you could have FaceTime Audio as a quick action. Or FaceBook Messenger, Twitter, Skype, WhatsApp and more. Cardhop understands these words and acts on them whether you add them to quick action buttons or not. So as you use the app more, you can decide which buttons will be most useful and change them as you need. With Apple's Contacts app, if you AirDrop your own contact details to someone, they get everything. They might only want your work email, but they get your home one, your cell number, office address, the lot. In comparison, Cardhop lets you specify a subset of information that you're happy to share. 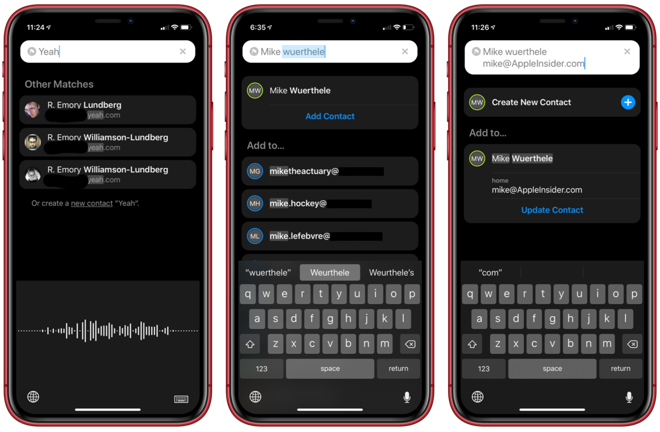 Whatever you're doing in Cardhop —typing a quick action or looking up someone's contact —you can turn your iPhone to horizontal and the screen swaps to show your business card. Your name, title, and three other fields of your choosing fit on this card —plus there's a QR code that makes it easy for anyone with a reader to add your card to their own devices. Next to this business card image there's an edit button that lets you specify just which bits of your information you want. And there's a Share button for when you're talking to a normal human being who doesn't carry a QR code reader all day. You'll see the benefits of Cardhop as soon as you try it. 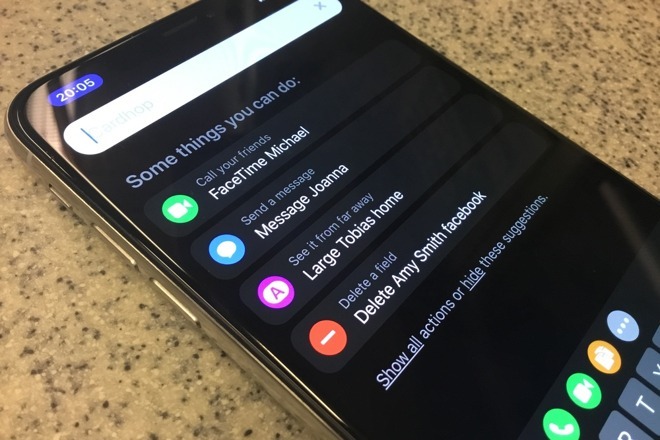 However, if you then get into the habit of starting calls and emails and everything else to do with contacts there, you'll feel the benefits too. From our experience with the Mac version, once you make it a habit, you come to like and rely on Cardhop hugely. For an app that you need to use to appreciate, though, Cardhop doesn't try to keep you to itself. 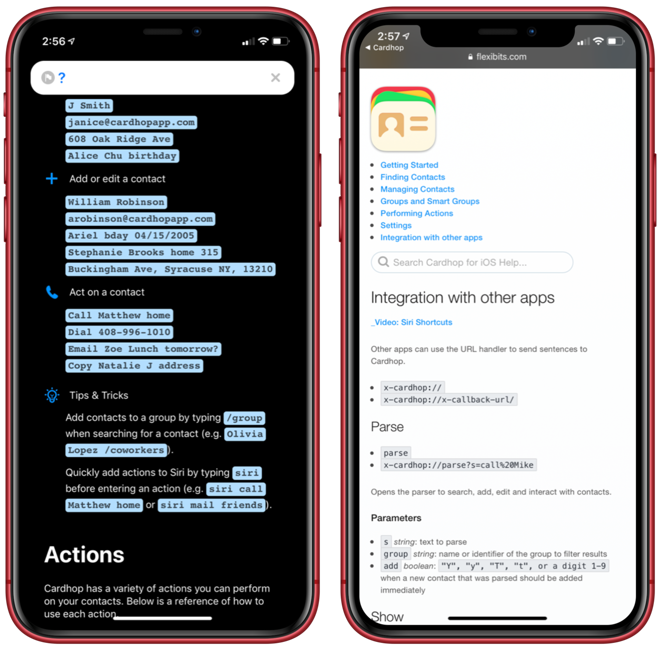 You can use it via Siri Shortcuts and create workflows to show your favorites, for instance, or to show your recent contacts. That's a particularly useful part of Cardhop —whether through Shortcuts or directly inside the app, you can see who you recently called, emailed or messaged. It's no kind of Customer Relationship Manager, but it's handy when you're temporarily contacting someone a lot yet it's not worth adding them to your favorites. By default, Cardhop does all this with your regular iCloud contacts list. However, the new Cardhop for iOS and now also the updated Cardhop for Mac support Google Contacts, G Suite, and Microsoft Exchange's Global Address List. As it stands, Cardhop for iOS is excellent for turning your flat contacts list into a tool that you use to stay in touch with people. It's great for acting on that contacts database and digging through it, but it doesn't do anything about that database itself. It would be good to see features to make managing duplicate contacts easier. And then there is the perennial problem that so many of us have email addresses that we only think we've saved in a contacts database. Apple's Mail is so good at autocompleting addresses of people we've previously heard from that we don't even realize it is doing that. We assume it's autocompleting from our contacts database and since it isn't, when we try to access a contact on another device or in another app, we don't find them. That's systemic, it's not something a third-party Contacts app could fix, but maybe Apple's one should. 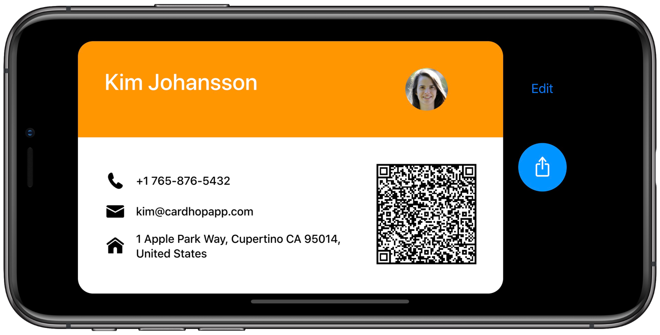 In the meantime, as robust as Apple's Contacts app is, Cardhop can make better, faster use of all those names and email addresses you've collected. Cardhop for iPhone and iPad requires iOS 12 or later and after a launch period where it costs $3.99, it will be $4.99. There's also the Mac version, which requires macOS El Capitan or later and costs $19.99 direct from the Flexibits developer's site where you can download a 21-day trial.